You may think your eyes are deceiving you but marine biologists in the South Pacific have discovered the world’s first “glowing” sea turtle. David Gruber of the City University of New York and his team were filming small sharks and coral reefs in the Solomon Islands when they managed to captured footage of the hawkbill sea turtle emitting neon green and red light. Gruber, who is an emerging explorer for National Geographic, described the turtle as looking like a “spaceship”. It is thought to be one of the first times that a biofluorescent reptile has been seen by scientists. Alexander Gaos, director of the Eastern Pacific Hawksbill Initiative told the National Geographic that the discovery was “really quite amazing”. "I've been [studying turtles] for a long time and I don't think anyone's ever seen this," Gaos said. The group only managed to capture a few moments of the turtle but after speaking to locals he discovered a nearby community that kept several captive young hawksbills. 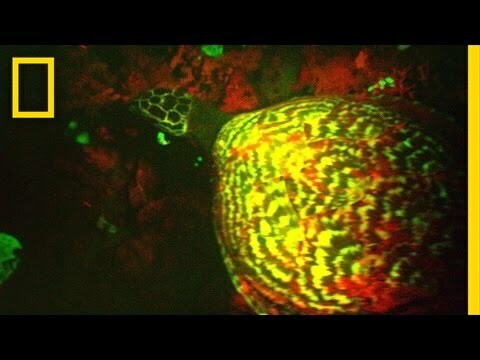 When Gruber examined the captive turtles he found that they all glowed red. At this stage the scientists are still unclear as to why these turtles have the ability to fluoresce and whether other species turtle might have the same ability. "[Biofluorescence is] usually used for finding and attracting prey or defence or some kind of communication," said Gaos. Hawksbill sea turtles are one of the rarest species and their population numbers are thought to have decreased by 90 percent in recent decades. The Solomon islands are famous for having some of the world’s best dives. Private yachts and superyacht charters in the Solomon Islands are still relatively uncommon allowing you to explore this remote destination almost exclusively and hopefully spot your own hawkbill sea turtle.